Figure 1. DNA basic parts domestication. First construction refers to promoter GB domestication. Part BBa_K2656004 is the constitutive low promoter BBa_J23106 adapted into the Golden Gate grammar. Thus, it is compatible with both Biobrick and GoldenBraid assembly methods. 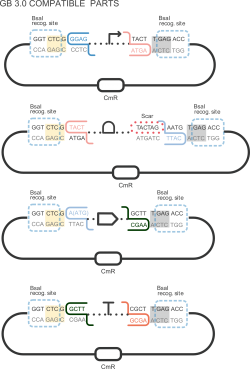 Following the Golden Gate assembly protocol , it can be combined with other GB compatible parts from our Valencia UPV IGEM 2018 Printeria Collection to assemble transcriptional units in a BsaI Type IIS one-pot reaction. By using this experimental protocol, we have obtained the parameters to valide our constitutive model and so rationale choose its optimized values based for each promoter tested. Table 1. Optimized parameters for the BBa_K2656004 promoter. We have also calculated the relative force between the different promoters, taking BBa_K2656005 promoter as a reference. Likewise, the promoter ratio (p parameter ratio) of the different promoters referring to the stronger one has been calculated. Table 2. BBa_K2656004 relative strength and p ratio.